We have a large fleet of single man kayaks suitable for all age groups and abilities. Sessions start with a land-based introduction and students then improve their skills and confidence through a number of different games and activities on the water. Short trips and fun games are all part of this great session. One of the most popular reasons for choosing a canoeing session is the team work that is required between the students in each boat. This unique craft is ideal for all ages and abilities. Katakanu are very stable boats which can be paddled by up to 6 students. These sessions often include a short river trip. The Centre has various sized boards and sails so that all ages can have fun in a range of wind conditions. The shallow water of the harbour means that this is a perfect location for beginners to learn the basics of this adrenalin-fuelled sport. Students are taught to tie a few basic knots and lashings, then work in groups to design and build their own raft with an instructor on hand. Then it's time to hit the water. Each raft team will take part in various challenges, followed by a raft race. Be ready to get wet! Each student practices shooting down the range before getting involved in competitive team games. A great session that can be run over an hour or longer and can also be run on your school grounds. Our brand new "Learn to Row" boats have just arrived at the Centre. With these super-stable boats, learning to row has never been so easy. As the students progress, they move onto more advanced boats rowing in either singles, doubles or our quad boat. Small groups can take part in basic boat driving skills and if conditions are right we may leave the harbour for high speed work. During your session you will take a trip up the river practicing berthing and other manoeuvres such as Man Overboard. With a landscape as diverse as Hengistbury's, there are plenty of fantastic landmarks and features to navigate your way around. The session starts with some basic map work followed by an orienteering course on the Head. We have two different courses for different ages and capabilities. First aid is a valuable life skill to have for both teachers and students. We offer a range of HSE (Health and Safety Executive) first aid courses at the Centre and would also be happy to run them in your school. Our staff offer fun, interactive, practical first aid lessons at unbeatable prices. At over 7 metres high, our climbing wall is a fun challenge for most youngsters. This session can be booked for an hour or half a day. We can also bring the climbing wall to you, where our fully-qualified instructors run the activity, leaving teachers free to work with other students. At Hengistbury Head, we will work with you to create the perfect visit. We can come to you to arrange your trip, or you can come to the Centre for a pre-visit. This will allow us to plan your excursion down to the last detail so that it works perfectly with your individual needs as a school or group. 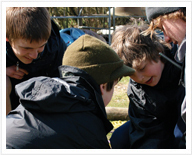 Perfect for team building and group dynamics, these sessions include any of our activities. These are a great value alternative to a residential break away, and offer many of the same opportunities. You can create your own activity week selecting from our range of activities. These sessions can be booked giving students the opportunity to progress at a particular sport, or try a number of different activities. The ideal addition to your school-based activity week, activity days give students the opportunity to try a number of different activities in a day. Our mobile climbing wall can visit any school for a day or more and can be booked for events, fetes or as part of a PE lesson. Fully-qualified instructors run the activity, leaving teachers free to work with other students. The 7.5 metre wall offers challenges for all abilities and can accommodate 48 students during the day.